BOSTON - Despite two goals and an assist from senior Pete MacArthur, the Boston University men's ice hockey team fell to No. 20 Massachusetts, 5-3, on Friday evening at Agganis Arena. The Minutemen broke a 3-3 tie with under seven minutes left and added an empty-netter late to drop the Terriers to 2-5-1 overall and 2-2-0 in league play. The Terriers burst out of the gate, as MacArthur scored his first goal off a pass from junior Chris Higgins on the first shift of the game. But after the Minutemen (4-2-2, 2-1-2 HE) scored twice in the first period to pull ahead, Boston University was never able to regain the lead. Goals from senior Bryan Ewing and MacArthur help the Terriers hang with the visitors well into the third period, but sophomore Will Ortiz potted the game winner before the empty-netter created the 5-3 final. A scant 33 seconds into the first period, the Terriers recovered the puck as the Minutemen defense was trying to clear it behind their goal. MacArthur got a clear shot on goal, after passes from Higgins and Ewing, and shot a laser past the netminder to put the Terriers ahead quickly. However, it was the last lead BU would see. The Minutemen struck back less than three minutes later, as freshman James Marcou collected the puck behind the Terrier goal on a Minutemen power play and forwarded it to freshman Chase Langerapp just outside the crease. Langerapp found senior captain Michael Kostka, who took an open shot that got through a narrow hole on BU sophomore Brett Bennett's glove side to knot the game at one apiece. Massachusetts pulled ahead towards the end of the period off an unassisted goal by junior Topher Bevis with 3:05 remaining in the first. Ewing tied things up again midway through the second period, after MacArthur fought the puck away from the Minutemen defense on a Terrier power play and found sophomore Brian Strait with an open lane towards goal. Strait placed his shot, which was redirected into goal from just outside the crease by Ewing with 12:22 left in the second period. 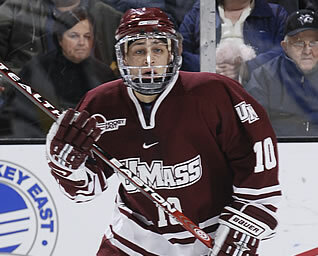 The Minutemen scored their first of three third-period goals with 13:14 left in the period, as Marcou won the puck in a scrum in front of the net on a Minutemen power play and directed it towards Langerapp, who found a hole in all of the confusion to regain the lead. The advantage was short lived, however, as MacArthur scored his second goal of the game off a pass from Higgins to tie the game with 11:37 left on the clock. A failed attempt by BU to clear the puck after a face-off resulted in the game-winning goal, as UMass sophomore Justin Braun intercepted a puck along the boards and found Ortiz on the other side of goal - just outside the crease. Ortiz took his shot before Bennett could shift sides, scoring the winner with 6:46 remaining. The Minutemen's final goal came with 31.1 seconds remaining in the game with Bennett pulled for an extra attacker. Senior assistant captain P.J. Fenton collected the puck in the neutral zone and dashed towards goal to net the game's final score. BU held a slight advantage in shots, taking 29 to UMass' 28. However, Minutemen freshman goaltender Paul Dainton's 26 saves turned out to be the more important statistic, beating out Bennett's 23. Massachusetts also took better advantage of power play opportunities, scoring on two of its four chances. The Terriers only netted one goal on five power plays. The loss comes on the heels of BU's first two victories of the season, a 5-2 win over Providence and a 7-4 victory against UMass Lowell. The Terriers stay in Hockey East for their next game, as the team takes on Northeastern on Saturday, Nov. 10, at 7:00 p.m. at Matthews Arena in Boston.